Not only was the author’s consequential life revealed in a personal and reflective narrative/memoir, but his insights on the importance of as well as the process of writing history were enlightening and explored fully as well. The implications and consequences of both phases of Dr. Lewis’ life and craft as revealed in this memoir will be discussed in this review. First, Dr. Lewis’ expertise lies in the study of Southwest Asia, and the Middle East; with particular relevance to promoting an understanding of the interaction between Islam and the West. What is particularly important is his knowledge of the major languages spoken in these regions. Further, at this point in time, these are areas of crucial importance to policymakers in which enlightened and educated opinions are needed to further the process of decision making by rational individuals. This need is accentuated in this era of 24 hour news cycles fostering explanation by ideology and bombast, in which too little time is devoted to reflective historical analysis. Gone are the days when civility and wit ruled our discourse even during discussions of such diametrically opposed interlocutors as William F. Buckley and Gore Vidal. Why is this the case, and how can the thoughtful praxis of a historian such as Dr. Lewis provide remedies for the current spate of uncivil discourse and the dissemination of outright falsehoods; and what is the historian’s in this process? What Dr. Lewis does is to shine a light on the material he is exploring in an evocative and rational manner. 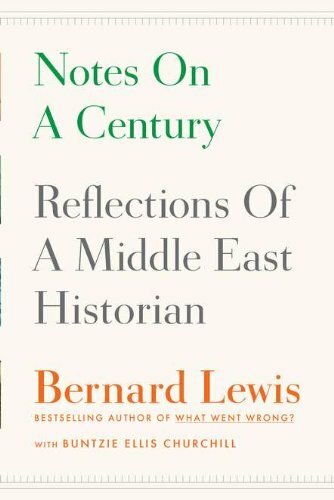 As a historian, even though he is often at odds with other scholars of the Middle East such as Edward Said, he still manages to present fully developed ideas and let the reader make his own judgments on the merits of the scholarship. This is particularly true in such works of his as the: Political Language of Islam, What went Wrong, Islam and the West, The Crisis of Islam, and Semites and Anti-Semites. Each of these works explores in detail how the interplay of historical actors at particular moments in time have created the multilayered context of a times in interactions both between different societies, and within our own society as is reflected in the knee-jerk, and simplistic explanations of the American Radical Right. How does all this relate to the writing and craft of history? And how can this approach be used to “explain” such historical events as the Arab Spring? In this regard Lewis believes that the contemporary historian must be able to identify events differentiating the results of the Arab Spring in such countries as Libya, Tunisia, and Egypt; place them in the historical context for that specific country; and then describe and create a relational framework to assess and determine the impact of these events for the rest of the world, but most importantly for policymakers. Dr. Lewis deploys a deft hand in helping us decipher the complexity of these historical events. He systematically presents, region by region, who the players are; what their goals are; and more importantly, what the U.S. and other international actors can do to respond to and proactively relate with the transformations that are occurring as a result of the “Arab Spring”. For this and for other reasons we as historians are in debt to the life and work of Dr. Lewis.